We are pleased to share our latest newsletter. If you have questions, please feel free to email me. Law School for Interpreters: A Success! Meanwhile, the sponsors were all busy opening the facility and readying the room and registration tables for each of these interpreters. At 8:45 a.m., seats filled and the LEP Work Group provided an overview of the day and the program began. Registration and Breakfast 8:00 a.m. Welcome & Overview 8:45 a.m.
“Oh the Places You Can Go and the People You Can Meet” (Overview of the SC Judicial System) 9:15 a.m.
South Carolina State Court Interpreter Certification Program 9:45 a.m.
Panel Discussion & Q&A: Reality Check 3:15 p.m.
Post-test, Wrap-Up, & Evaluation 4:45 p.m. The excitement in the room was palpable. Interpreters greeted one another with hugs, and sometimes questions of “which language do you speak?” And the excitement was not limited to interpreters and translators. Many of the event sponsors were thrilled with the turn-out, especially on a Saturday. Languages represented included Spanish, French, Portuguese, Italian, Chinese, French, and Urdu as well as a few others. And we’re all excited about the prospect of an additional pool of qualified and certified interpreters and translators in the South Carolina Court System. Thanks again to our sponsors, speakers, and participants! Want to Interpret in the South Carolina Courts? Join us on Saturday, February 11, 2012! Cost: $35 – includes breakfast, lunch, snacks and materials! Pay by check or Discover, Visa or MasterCard. Program begins promptly at 8:45 a.m. and ends at 5:00 p.m.
Space is limited and preference is given to South Carolina residents. Registration MUST be post-marked no later than Friday, February 3, 2012. No refunds for cancellations received after Friday, January 27, 2012. For more information, please email ccoker@scbar.org or call Robin Wheeler at (803) 576-3808. At our recent SC Access to Justice Commission meeting, we had a guest speaker who presented on Language Access and the growing need for language access in the civil court system. And, while many of us understand the laws that govern language access, especially in the legal system, the fact still remains that in order to provide qualified interpreters, these qualified interpreters must be available and accessible. Most everyone I’ve spoken with has noted that we need more qualified interpreters. We simply do not have the numbers of qualified interpreters. During our preliminary conversations, we learned that while there is a general interest to interpret, many in the interpretation community were unfamiliar with legal terminology and courtroom decorum. And, interpreters were hesitant to pay to take the South Carolina Court Interpreter exam without at least an introduction to the legal system in South Carolina. As a result, Law School for Interpreters was created. 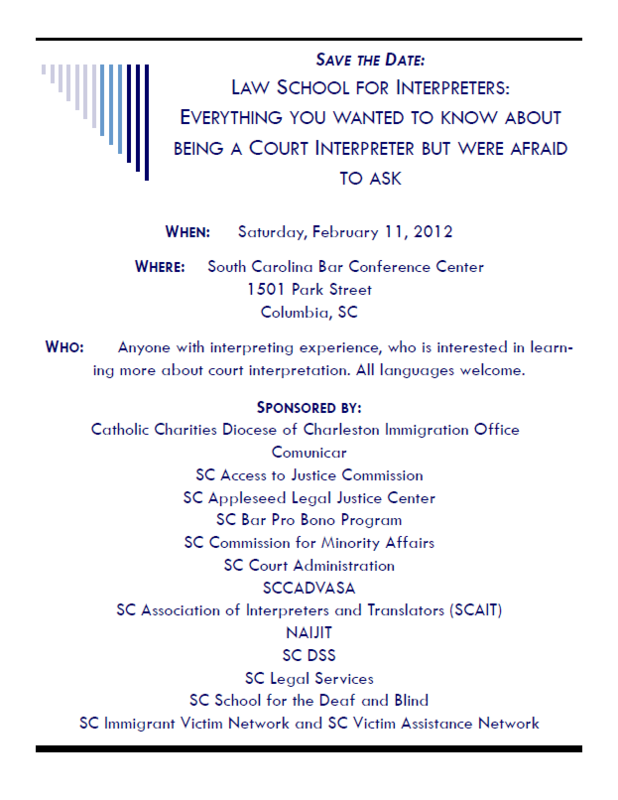 I’m pleased to introduce the Law School for Interpreters which will be held on Saturday, February 11, 2012. We have a great line-up of speakers including attorneys and at least one judge. The sponsors for the event have all been working together with the Commission as we try to increase the number of qualified courtroom and legal interpreters. If you, or someone you know, is interested in this course, please complete and return the registration form – Registration for Law School for Interpreters Feb 11 2012. As part of Celebrate Pro Bono 2011, we are highlighting pro bono legal service in South Carolina. 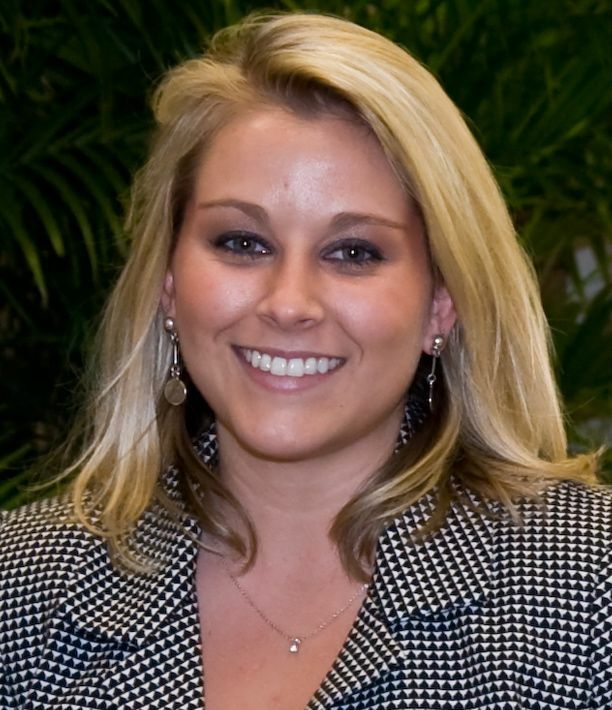 Meet ASHLEY COLE, 3L at the University of South Carolina School of Law. She’s been participating in the law school’s pro bono program for 2 years now; serving on the board since her 2nd year of law school. While Ashley continues to serve as GAL, she also stays involved in a lot of projects. Right now, we’re gearing up for our semester food drive for Harvest Hope. It’s my job to get my classmates involved because we have a competition between the three law classes. I want the 3Ls to win this year! We’re kicking-off the food drive with a “It’s Not a Crock Pot” soup lunch to raise awareness for hunger. I’ll be entering a soup in the contest on behalf of an organization I’m involved with. Also, we’ve been hosting a “Good Deed Friday” project about once a month where students who are involved in Pro Bono get together with students from other law organizations to perform community service in and around Columbia. This semester, we kicked-off a new program called “Carolina Clerks” that allows attorneys with a pro bono case to obtain assistance from a USC Law student. That program is wonderful because it provides help to the attorney while simultaneously providing experience to a law student who is eager to learn. Ashley’s passion for pro bono doesn’t stop there. One semester, I participated in a “Pro Bono and Jelly” hunger awareness bake sale during the food drive. We encouraged students and faculty to bring their lunches and donate the money they would normally spend eating out to Harvest Hope. I have also visited retirement centers with other volunteers to sit down and talk with senior citizens about their legal needs. We fill out surveys to identify how the legal community can best serve this group of people. Additionally, this summer I worked with South Carolina Legal Aid as a public interest law clerk, so I stayed on this semester as a volunteer. Our Pro Bono program has close ties with that office because they serve the public. I performed a lot of community service in high school and during my undergraduate career, so it seemed silly not to continue doing good things for others when I started law school. Admittedly, it’s a lot more difficult during your first semester to get involved, but once I settled in I wanted to find out what I could do. Pro Bono opportunities have provided me with a lot of hands-on legal experience. I’m so thankful for the program, and I really enjoy working with students and people in our community. I really believe that one of my responsibilities in this profession requires me to give back some of my time to people who really need it. A lot of people don’t understand our judicial system, so law students and practicing attorneys should aspire to reach out to them and make the experience as helpful as possible. From my pro bono experiences, I have learned quite a lot about who I am, who I want to be, and what kind of law I think I might pursue. For example, I learned that family law is more difficult because of the emotional element that’s always present when you speak to a client or work with family members. Pro bono work has taught me patience and understanding. When you realize that you have to explain legalese to someone who may or may not have graduated from high school, your perspective changes and you realize how valuable your services are to the clients you serve. I have also learned how fortunate I am, and I’m thankful for the experiences I have had. I think that pro bono speaks for itself. Truly, a person only needs to get involved in one pro bono program to experience the joy and pleasure of doing good things for other people. Everyone has a little time to sacrifice, and it only takes one project or one client to keep a law student engaged and active in pro bono work for life. Is Ashley’s pro bono going to continue into her law practice? Most definitely. I think I would be doing a disservice to myself and my community by not engaging in pro bono work. That is music to my ears. We are lucky to have have such dedicated young attorneys and law students who cannot imagine their profession without giving back. Stay tuned as we highlight them throughout this week!